On this morning's 10am Whale Watch on the Cetacea, we headed back to where we left the fin whales yesterday. We when arrived, we spotted the blow of a fin, but this animal ended up taking long dives and we did not see it again after the first surfacing. After spending some time waiting for this whale, we decided to head further south the SW corner of the bank, and while we did find two minke whales briefly, we didn’t have any other sightings. Once again, we also saw a good amount of Northern gannets. We also encountered some of the marine debris during our trip, which we picked up while out on the water. 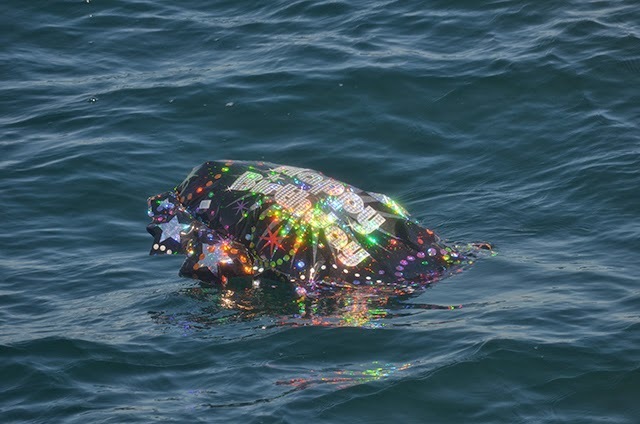 Mylar balloons can be very harmful to marine life, so shout out to our crew for collecting this party favor.